Oh. My. Gosh (for the correct effect, picture Janice, if she were a Christian, of course ;-)). 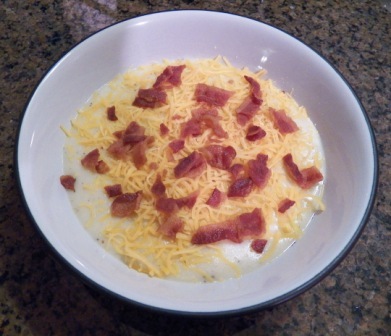 I can hardly believe this soup is only 5 Weight Watchers Points Plus points per serving (well, 6 the way I made it, because I used a little more bacon :-P). I found this recipe thanks to Pinterest; adapted from skinnytaste.com. Pierce potatoes with a fork; microwave on high for 5 minutes. Turn over and microwave another 3 – 5 minutes, until tender. If you prefer to use your oven, bake at 400° for 1 hour or until tender. Cool. Peel potatoes. Meanwhile, steam cauliflower with water in a large covered pot, until tender. Drain and return to pot. Add chicken broth, milk, potatoes and bring to a boil over medium heat. Use an immersion blender to puree until smooth. Reduce heat to low. Add sour cream, salt & pepper to taste, half the chives and cook an additional 5 – 10 minutes, stirring occasionally. Remove from heat. Ladle 1 cup soup into each bowl. Top each serving with 2 tbsp cheese, remaining chives and crumbled bacon. Serves 5. Serving size 1 cup. I served this soup with a side of Alexia’s Spicy Sweet Potato Fries, as they are A.M.A.Z.I.N.G. and only 3 pts for 30 fries!!! This was a great dinner and plenty of food!